Kojin, a young wingless female mirror. She is always a bit nervous due to past battles, but she really just wants to be able to have fun and do good things for other dragons. She trusts most of the guild members deeply. Krv, a young male mirror with a violent backstory. He is just trying to make amends with the guildmembers, and have become friends with some of them. Actually a good fighter, but sometimes fears what his own claws can do. Fern, a young male pearlcatcher who isn't really into fighting. He like peaceful solutions, not violent ones. The three young dragons were left alone in the forest, each of them still trembling a bit. The woods were too silent, the shadows looming over them like claws trying to tear at their scales. One dragon finally broke the silence. "We have to go back." Kojin whispered, as her voice seemed to not want to work right after the encounter with their clan-mate. The other two dragons just nodded, and already knowing where, they all walked back through the woods, not another word being exchanged. They were surprised to find that the entrance was unguarded. It was always well guarded by a snapped female mirror- Nightwatcher- and a silent male Imperial- Rune. But neither were there. "Do you think-" Fern started, but was immediately cut off by Krv's sharp glare. No one wanted to think about what could've happened. There were enough Nocturne's in their lair to put up a good fight, and if they were being controlled and had extra strength- then there was no knowing what they could've done. And so they did all they could do- go inside. It was a mess. Dragons laid limp on the ground, some of their only movement the small rise of their chests. "We need to do something-!" Kojin started towards the dragons, but was suddenly tackled over by a large Nocturne. 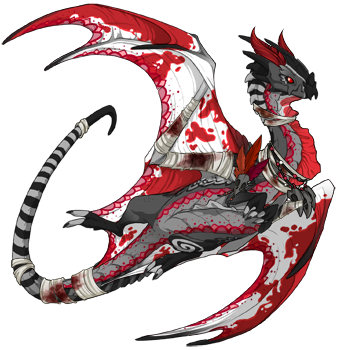 Her scales were a white color, but the paint-like pattern along her body made it look like blood was splattered all over her from previous fights. 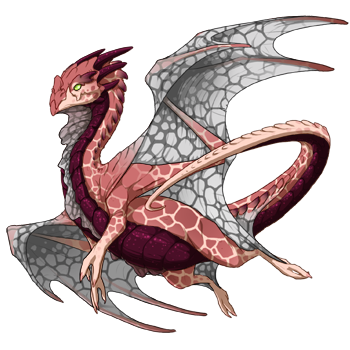 Crimson was one of the most dangerous dragons in the guild. And she had Kojin by the throat. Kojin was trying not to tremble as she felt the dragons fangs lock around her throat, really to jerk back and tear it out. She heard the other two dragons surprised shouts, but her heart was beating too loud to make out if they were saying anything. 'I don't want to die. Please, please don't let this be my last breath.' She thought, knowing she couldn't get out of the dragons grasp. Other dragons would be able to flap their wings to annoy or distract the dragon. But her, the small wingless dragon could do nothing but wait for the sharp pain, then darkness. "Who do you think could've brought the mimic in?" Krv asked, clearly just trying to drive anyway the silence in the place that was usually so full of dragons. "I don't know. It could be anyone. It was probably an accident. I don't know of any Nocturne in here that would want to kill the guild." Fern said, his tone a bit hushed. All three of them knew what was being implied. None of the nocturnes would, but maybe some of the mirrors would. All three of them jumped at the sound. It came again, and they all peered into the room. A large male Nocturne was in the water, lashing out at two dragons who was fighting him, without much hope in their eyes. A male Pearlcatcher- Melon- was dodging his hits and then making small lashes back, and a male Sprial-Strawberry- was doing some fancy flying, trying to distract the dragon from hurting Melon. Suddenly the Nocturne made a leap, and caught the Spiral in his mouth, his fangs sinking into his scales. Strawberry cried out, trying to struggle out of the Nocturne's grasp. Melon lunged at the Nocturne's throat, but the fact that he hesitated showed clearly he didn't want to kill him. Of course. Who would want to kill one of the guildmasters? Krv burst out of hiding and ran into Shadowripple's side, making the dragon off balance. He released his grasp on Strawberry to snap at Krv, and Melon quickly ran over to the Sprial's side. Kojin couldn't remember the details of the battle afterwards. It had been such a blur, but in the end Shadow was on the ground, pinned to the ground with rope that they had found. All of them had injuries, but none as bad as Strawberry's. The Spiral's breathing was labored, and Melon sat beside him, his eyes brimmed with tears. "You are going to be alright, ok? Ok. You can't die. I won't let you." The Spiral gave him a weak smile, but it was clear that he was in a lot of pain. Kojin was carefully wrapping up his wound in bandages. He would be alright, as long as no one came along and attacked them again. Melon started to speak without looking up from his friend. "It happened so fast. Suddenly, all the Nocturnes attacked everyone. Some of us were able to hide but…it was only a matter of time before we were found." The three dragons had to continue. Melon stayed back to take care of Strawberry, but wished them luck. They had reached another room, but it was completely dark. Suddenly there was a small sound of laughing, but it almost seemed to echo itself. Two Nocturnes crept out of the darkness, their soft pink scales gleaming in the small amount of light. Without hesitation, the dragons lunged. Kojin immediately had to defend herself, but the dragons claws cut into her scales easily. 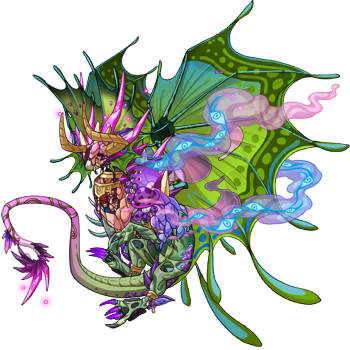 She heard Krv shout something, and then the mirror attacked the Nocturne, forcing him away from Kojin. Kojin felt stunned for a moment as she watched the two dragons tearing at each other, but then she remembered the other dragon. Turning around, she saw the second one pinning Fern to the ground. She was just about to rush over to him before getting pinned herself. 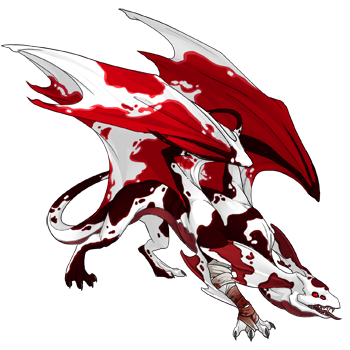 'But- Krv was fighting- is he alright-' Her thoughts were in a rush, and out of the corner of her eye she saw Krv laying on the floor, his white scales almost completely covered in red. She couldn't tell if he was breathing. Her own breathing sped up, and the last thing she saw before passing out was her attacked roaring at some other foe. 'Fern?' Was her last thought before everything faded to black. Kojin opened her eyes to see a red mirror in front of her, muttering to himself as he started a fire. "Idiotic guild. Can't even keep each other from tearing each other apart." Kojin shifted, trying to see her friends. The mirror jumped a bit, looking at her. She was startled to see his eyes, a piercing ice blue. 'Ice Flight.' "Huh. Your awake." Kojin tried to sit up, but a wave of dizziness swept over her. "What- where-" She broke off into a fit of coughing. "Your in the guild. In fact, we are in somewhere that no one but me knows about. And your precious guildmaster. And the dragon who guarded me while I was imprisoned." He looked away, focusing on the fire again. "Imprisoned?" He paused, then nodded. "Yes, I suppose you wouldn't know the darker parts of this guild. But that doesn't matter right now. That idiot Nocturne brought a Mimic in here. Shadowripple, was it?" Kojin was stunned for a moment. Why would he bring one into the guild? "Not on purpose, but once the Mimic saw his weaker companion, Raal, he took control. In fact, the mimic is right above us. We just need to kill it." Kojin gave a weak nod. "Well, now that that is clear…" the mirror looked her in the eyes. "I may as well tell you my name. It's Kinak." Once Kojin got her strength back, she found her other two friends alive but injured, and not having yet woken up. Even if they waited for then to wake up, they wouldn't have been able to fight alongside them. It was a bit of trouble getting Kojin out, considering the whole 'no wing' thing, but she managed. Kinak froze. "It's over there. That chest, isn't a chest. Get too close, it will lung up and snap your throat in a second. Unless you befriend it but…" he narrowed his eyes. "I wouldn't befriend something like that." They crept closer, and Kojin couldn't help but whisper. "So what is your familiar then?" Kin paused. "A corrosive depin. Actually that could work." He muttered the last part. "What could work?" Kojin asked, slight edge of excitement in her voice. "The corrosive depin can melt stuff, it's acid is pretty strong…" He grinned, and then whispered something. Suddenly the depin appeared, a bubble of water surrounding it. Kojin noticed how much alike the dragon and familiar looked as they crept closer to the mimic. "Okay. You bait it, so it will open its mouth then…we end it." Kojin nodded. This was it. This was where everything could go right…or horribly wrong. Kojin leapt in front of the Mimic, and its mouth opened with surprisingly agility, sharp fangs showing. She still felt surprised that the chest looked so…not alive. And now it was trying to kill her. Only a second later the depin used its acid on the mimic. It made a screeching sound as it melted, the mimic now gone. Kojin stumbled back into a sitting position with a sigh of relief. "Is that it? Did we do it?" She said, turning to Kinak. But he was gone. As if he had never been there. The next day was full of dragons recovering, and Nocturnes apologizing to the dragons, even if it hadn't been their fault. No one had been killed, but plenty were wounded. All the dragons saw Kojin, Krv, and Fern as heroes. Krv and Fern insisted that Kojin did it all. But she insisted that it was a mirror. A mirror by the name of Kinak. A mirror that no one remembered but her. Fog, a Druid, but a bit unorthodox. Her runes expel mist; sometimes it’s dangerous, thick, poisonous death mist, but sometimes it’s aromatherapy that smells like lavender (especially when she’s nervous or scared). Secret’s small size is made up for by her booksmarts and logic. She’s a very logical dragon, and though her brain is very crowded and full of odd thoughts and ideas, sometimes her ideas come to help the clan in dangerous situations. She never leaves her friends. Coral’s invisible, but they’re also blind, which can be a bit of a disadvantage. However, Coral has a way of sensing dragons and knowing where they are compared to others, even if they don’t know where they are in terms of space; for example, Coral will often bump into things, but never other dragons. “I knew it was a bad idea to leave just the three of us,” Secret lamented, and fluttered up on top of Fog’s head. “Understood!” Secret chimed, now enthusiastic once again as usual. “Got it!” Fog added, though if she was going to be honest, it was just so she could sound excited. She was actually scared out of her scales. Coral nodded in approval and lifted their head up to sense the air. “That way.” Coral pointed South and the trio headed onward. It was a while before Secret yelped and spread her wings in front of Coral and Fog, preventing them from stepping any further. “There! On the ground!” Sure enough, fluorescent Mimic Powder glowed dankly on the grass in front of them. Secret gathered it into her scarf before tying a knot in it and nodding. “Fantastic! Let’s go free our clan!” Secret flew a bit ahead before gasping as she came to a clearing. “Guys...” Around the clearing were guards, all Nocturnes, their eyes a creepy black from the influence of the mimic, some of them unrecognizable, not even from their clan. In the center, the ones being guarded was the entire clan, the leader and the hatchlings included. On top of the pile of dragons sat the mimic, a chest picking the coins out of the dragons’ pockets and bags and cackling evilly. Secret made way to hide herself, but it was too late. The mimic had noticed them, and alerted the Nocturnes, who, in turn, lunged to attack the trio. Fog stumbled back a few paces and was about to turn tail and flee, but Coral grabbed her and shoved her in the way of the Nocturnes. “Just TRY!” Coral roared, and knocked an unfamiliar Nocturne off their tail. Fog yelled a battle cry and shot plumes of mist out of the runes all over her body. Secret and Coral took deep breaths and covered their faces. Secret curled up in a ball in Coral’s hood, bracing herself. When the two dared to open their eyes, the field was covered in sleeping dragons. Fog had done it, she’d successfully used her sleeping mist, and had defeated an entire armada (okay, not really. A lot less than that) of Nocturnes. “Now let’s get rid of that mimic.” Coral said approvingly, and adjusted their hood so Secret could fly out and hug Fog’s head. “Great job!” The dragons made their way over, guardedly, to the mimic, before realizing it had fallen on its side and wasn’t moving. “Is it dead?” Secret asked, and flew over to poke it. The mimic didn’t move. “Wha-? Thank you! I guess I really did do it!” Fog was happy, and she was rarely happy. Most of the time, she was nervous or afraid. 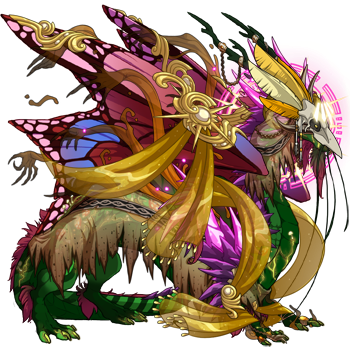 Nocturna resides in the same dutsha as Ruma; although their relationship is a bit prickly they seem to do just fine. Nocturna is adept at ice magic despite the sunny climate, working with the Lilies by using ice to reflect and absorb light. She and Ruma do a version of this, reflecting illusions by Ruma farther than possible normally. Ruma is a young adult who doesn't really know trouble, like most of the dragons who've spent their childhoods in the clan. She likes to cause trouble, and although she hates doing work, she isn't terrible- Ruma cares about others enough that she's willing to help now. She only got good at illusions because she uses them in pranks so much. Zaire spent his more youthful years as a snob, but entering the equivalent of the human thirties he's mellowed out. Generally away in the Hewn City, he's come home for the holidays. He may not be good at fighting, but he doesn't want to just sit there. He'll do his best. Zaire came over with Melicertes to say hi to Nocturna because he was in town, and although the two aren't close, Zaire and Nocturna had shared experiences from being third wave entries into the clan. Ruma meanwhile, just worked on a puzzle. Talking long into the night, the mimic invasion began quickly and suddenly, so all four fled in a panic. Melicertes, of course, got infected. "Ohhhhhh hohoho~ Now isn't this interesting! A fascinating discovery. How marvelous! How mysterious! Oh yes, I have to look deeper. You'll keep showing me your secrets won't you? Won't you? Oh please please please-"
The image in the mirror smiled, floating serenely amongst the inky void around it. It has simply happened upon this one of the clan that had come to collect the many treasures of this Night, rummaging around among the stores of trinkets and baubles that his clanmates that thought precious in hopes of finding new materials to toss into that retching, bubbling pot of alchemy down at the trading post. The coatl's lust for knowledge just needed the right... Incentive. So long as it provided what he asked for then without a doubt he would guard it zealously up until its plans came to their terrible fruition. "Well... To begin, I'm quite certain that Skitters isn't the mimic. My darling has been at my side this entire time and not up to any mischief. What of you two?" "I'm gonna have bruises... Who let that grouch hit like an Emperor... He's not even that big! It's not fa-" [cough] "Owwwwwww-"
"Hold still please, there's worse than bruises. Oh.. Edwyn, you're the only one with a mimic among us. And isn't your species supposed to avoid meat...?" Ignoring the skydancer's spluttering defenses and nervous wiping at his mouth, Holly quietly healed her friend. Of all the dragons to be told to save the clan it had to be the three of them. Untrusted newcomers. Those who had yet to prove themselves and earn their place among the brambles and ghost lights of clan Blackreach. But Shadowsong was right, there had been something wrong... The others had become more secretive, fewer and fewer seen out and about during the days. With their warriors out hunting for chests in the coliseum's wilds that left those still here largely unprotected- and they had welcomed an unusual amount of docile mimics into their fold as familiars with Edwyn's precious... Eugh, Skitters, being only the most recent of additions. Which of them had turned against the clan? Which creature had chosen to prey upon those who had welcomed it? With a heavy sigh for such a little dragon, the fae adjusted her goggles and shook out her wings. It was time to go earn their place. 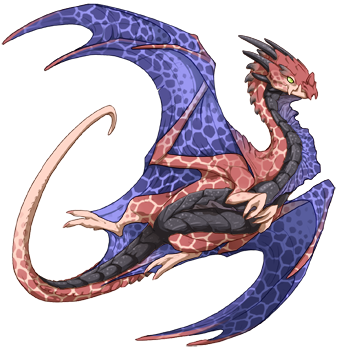 [url=http://flightrising.com/main.php?dragon=37814773] [img]http://flightrising.com/rendern/350/378148/37814773_350.png[/img] [/url] Femi, a dragon that is overprotective, and will sacrifice his life for his clan when needed. 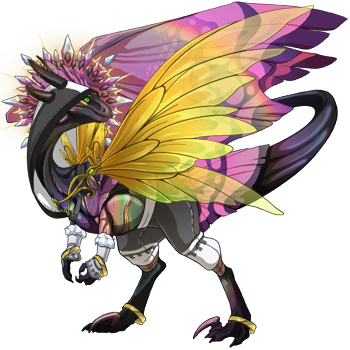 [url=http://flightrising.com/main.php?dragon=43736697] [img]http://flightrising.com/rendern/350/437367/43736697_350.png[/img] [/url] Nature, a mysterious Mirror who likes standing very still. 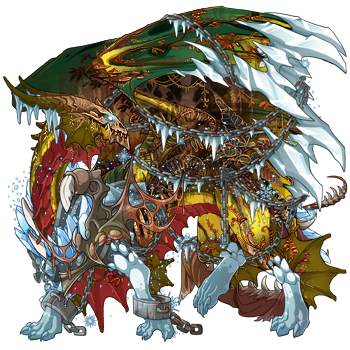 [url=http://flightrising.com/main.php?dragon=42992304] [img]http://flightrising.com/rendern/350/429924/42992304_350.png[/img] [/url] Naphero, an Imperial Dragon who once battled, but now is a scribe and philosopher. Though, he seems to have a unidentifiable power... [rule] Nature nodded somberly, looking down. They all gave each other silent glances before heading back. They all knew that there was a mimic in their wake, just waiting. Nature and Femi see all the threat in this, knowing how horribly wrong it can go for them. However, Naphero seemed to just do scribe stuff, like writing on a piece of parchment and stuff like that as they were walking back. They saw the lair in ruins, dust filling the sky. The nocturnes circling around the mimic noticed them and soon swarmed them. Femi screeched as he tried to attack, swiftly meditating and summoning an attack afterward. Nature was horrified to see that one of her nocturne friends had been consumed by an affection towards the mimic. Naphero wrote one, giant word on an unused piece of parchment before dropping it, clawing at the nocturnes. Nature then suddenly yelled, "Naphero! Do something!" Naphero looked at Femi, who was pinned down by one of the nocturnes. Naphero let out a roar, disrupting the fighting. He was easily able to pinpoint where the mimic was, and took that as an opportunity. He lunged at the mimic and sunk his teeth into it, killing it. The nocturnes looked at each other with confused looks, as if they didn't remember what they were doing. Soon, all the dragons slowly emerged from the safety of the ruined caves and chambers. Naphero went to the parchment he dropped, seeing how it was torn. He picked it up, smiling weakly as he saw the giant word was still intact. All the dragons gathered around, some seeing the word. Naphero then read the word out loud, saying, "Hope." 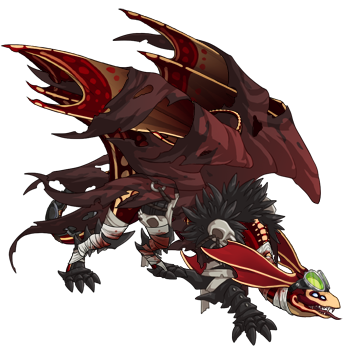 Femi, a dragon that is overprotective, and will sacrifice his life for his clan when needed. Nature, a mysterious Mirror who likes standing very still. Nature nodded somberly, looking down. They all gave each other silent glances before heading back. They all knew that there was a mimic in their wake, just waiting. Nature and Femi see all the threat in this, knowing how horribly wrong it can go for them. However, Naphero seemed to just do scribe stuff, like writing on a piece of parchment and stuff like that as they were walking back. They saw the lair in ruins, dust filling the sky. The nocturnes circling around the mimic noticed them and soon swarmed them. Femi screeched as he tried to attack, swiftly meditating and summoning an attack afterward. Nature was horrified to see that one of her nocturne friends had been consumed by an affection towards the mimic. Naphero wrote one, giant word on an unused piece of parchment before dropping it, clawing at the nocturnes. Nature then suddenly yelled, "Naphero! Do something!" Naphero looked at Femi, who was pinned down by one of the nocturnes. Naphero let out a roar, disrupting the fighting. He was easily able to pinpoint where the mimic was, and took that as an opportunity. He lunged at the mimic and sunk his teeth into it, killing it. The nocturnes looked at each other with confused looks, as if they didn't remember what they were doing. Soon, all the dragons slowly emerged from the safety of the ruined caves and chambers. Naphero went to the parchment he dropped, seeing how it was torn. He picked it up, smiling weakly as he saw the giant word was still intact. All the dragons gathered around, some seeing the word. Naphero then read the word out loud, saying, "Hope." 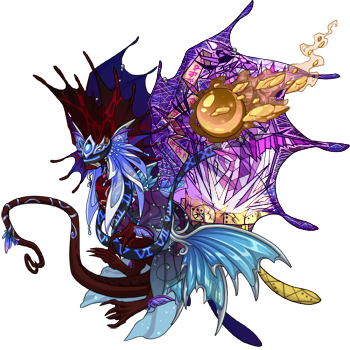 [center][b]The Three[/b][/center] [url=http://flightrising.com/main.php?dragon=20633451] [img]http://flightrising.com/rendern/350/206335/20633451_350.png[/img] [/url] Monkshood was afflicted by a mimic's influence and swore that he would never fall for one's again. So when he hears Shadowsong's words, he is quick to ready himself to save the clan. [url=http://flightrising.com/main.php?dragon=18916886] [img]http://flightrising.com/rendern/350/189169/18916886_350.png[/img] [/url] Tigris was readying herself to ask if one of the others could help her gather some herbs when the mimic attacked. She ran into Monkshood when she was escaping her part of the lair. She...kinda attacked him out of fear, but when he explained what was going on, she was quick to follow him. Upon hearing Shadowsong's words, Tigris swallowed her fear and swore to help however she could. 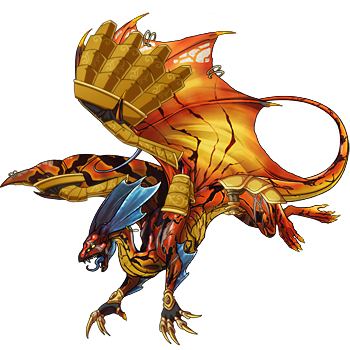 [url=http://flightrising.com/main.php?dragon=32799219] [img]http://flightrising.com/rendern/350/327993/32799219_350.png[/img] [/url] Spinel was confused. Why was his brother, Yew, acting so off? In fact all the clan's Nocturne's were acting weird. As the clan's Secretkeeper, he listened for the answers. One of them led him to Monkshood and Tigris. And when he heard Shadowsong's words, Spinel knew he has to work wito Tigris and Monkshood to save their clan. 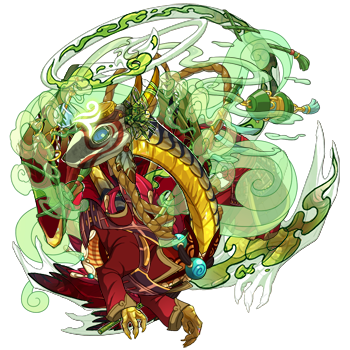 ------ [url=http://flightrising.com/main.php?dragon=38179462] [img]http://flightrising.com/rendern/350/381795/38179462_350.png[/img] [/url] Hawk, the one who brought the mimic into the clan. ----- All was quiet as the Narrowsky clan was making its prepartions for the day. Then, the clan's Nocturnes attacked. Everyone managed to escape with the exception of four dragons: Monkshood, Tigris, Spinel and Hawk. Monkshood, Tigris and Spinel were almost attacked when they were saved and given a task to save their afflicted clanmates. [Center]*****[/center] "So what is a mimic, exactly?" The young mirror asked his older clanmates. Monkshood almost growled in frustration, until a gentle nudge from Tigris reminded him that Spinel did not know of the events years prior. "A mimic, like Shadowsong said, is a being that can assume any form." The older pearlcatcher explained. "Some of the creatures that share our home are mimics, but this one is different." "Like a more malicious presecnce is feeding this one," Tigris added. "We can assume that from the reports from the clan's scouts, that Hawk could be behind this." Spinel was confused. "How?" The mirror asked. There came no answer from the older dragons. Spinel hurrumphed, as they neared the lair of Hawk. It was dark as they entered, not knowing what they were looking for. Tigris used as spell to call forth a wisp to help her two clanmates see, as the darkness was like an old and dear friend to the Skydancer, revealing all of its secrets to her. "Welcome," hissed a voice. The trio did not know if it was their clanmate or the creature speaking, as Hawk stepped forward. Spinel scanned the room, the faint light of the wisp casting an eerie glow on all the contents in the room. In the midst of the silent staredown, the Secretkeeper found what was hidden. "There...." the mirror whispered to Monkshood. The Pearlcatcher nodded and signaled to Tigris in the mimic's direction. He would keep Hawk's attention on him. "Hawk, did you not hear the order to evacuate?" Monkshood asked sternly. "It is not safe to stay here." But before the other male could answer, Tigris struck. Using her magics, the mimic was destroyed. Hawk screamed in rage. "How dare you...!" The Skydancer was knocked out before his threat could be finished. "Thanks." Tigris sighed in relief, as Spinel dropped the book he had used to knock Hawk out. "You're welcome." The mirror replied, shakily. Monkshood nodded, picked Hawk up, and turned to leave the dark lair. "Come," the pearlcatcher ordered. "Let's tell the others that all is well and we can start with rebuilding our lair." Tigris and Spinel nodded and followed their clanmates in rejoining the rest of their clan. Monkshood was afflicted by a mimic's influence and swore that he would never fall for one's again. So when he hears Shadowsong's words, he is quick to ready himself to save the clan. Tigris was readying herself to ask if one of the others could help her gather some herbs when the mimic attacked. She ran into Monkshood when she was escaping her part of the lair. She...kinda attacked him out of fear, but when he explained what was going on, she was quick to follow him. Upon hearing Shadowsong's words, Tigris swallowed her fear and swore to help however she could. Spinel was confused. Why was his brother, Yew, acting so off? In fact all the clan's Nocturne's were acting weird. As the clan's Secretkeeper, he listened for the answers. One of them led him to Monkshood and Tigris. And when he heard Shadowsong's words, Spinel knew he has to work wito Tigris and Monkshood to save their clan. Hawk, the one who brought the mimic into the clan. All was quiet as the Narrowsky clan was making its prepartions for the day. Then, the clan's Nocturnes attacked. Everyone managed to escape with the exception of four dragons: Monkshood, Tigris, Spinel and Hawk. Monkshood, Tigris and Spinel were almost attacked when they were saved and given a task to save their afflicted clanmates. "So what is a mimic, exactly?" The young mirror asked his older clanmates. Monkshood almost growled in frustration, until a gentle nudge from Tigris reminded him that Spinel did not know of the events years prior. "A mimic, like Shadowsong said, is a being that can assume any form." The older pearlcatcher explained. "Some of the creatures that share our home are mimics, but this one is different." "Like a more malicious presecnce is feeding this one," Tigris added. "We can assume that from the reports from the clan's scouts, that Hawk could be behind this." There came no answer from the older dragons. Spinel hurrumphed, as they neared the lair of Hawk. It was dark as they entered, not knowing what they were looking for. Tigris used as spell to call forth a wisp to help her two clanmates see, as the darkness was like an old and dear friend to the Skydancer, revealing all of its secrets to her. "Welcome," hissed a voice. The trio did not know if it was their clanmate or the creature speaking, as Hawk stepped forward. Spinel scanned the room, the faint light of the wisp casting an eerie glow on all the contents in the room. In the midst of the silent staredown, the Secretkeeper found what was hidden. "There...." the mirror whispered to Monkshood. The Pearlcatcher nodded and signaled to Tigris in the mimic's direction. He would keep Hawk's attention on him. "Hawk, did you not hear the order to evacuate?" Monkshood asked sternly. "It is not safe to stay here." But before the other male could answer, Tigris struck. Using her magics, the mimic was destroyed. "How dare you...!" The Skydancer was knocked out before his threat could be finished. "Thanks." Tigris sighed in relief, as Spinel dropped the book he had used to knock Hawk out. "You're welcome." The mirror replied, shakily. Monkshood nodded, picked Hawk up, and turned to leave the dark lair. "Come," the pearlcatcher ordered. "Let's tell the others that all is well and we can start with rebuilding our lair." Tigris and Spinel nodded and followed their clanmates in rejoining the rest of their clan. Pipseed, the clan's patriarch, was cleaning and maintaining the artificial Wrymwound in the center of the clan. A new type of fungus caught his eye, the magical essence nothing he ever seen before. Worrying that it could be a virulent strain and a threat to the clan, he harvested the caper and took it back to his room to run some tests. There, the mimic took hold of his mind much how the true fungus sporting his body never could [url=http://flightrising.com/main.php?dragon=1054432] [img]http://flightrising.com/rendern/350/10545/1054432_350.png[/img] [/url] The clan was taken over mostly by Pipseed's spores. They are benign and everywhere, allowing the clan leader to monitor the coming and going of the clan. In this instance, such omnipresence backfired and these same spores were used to seed into the minds of the non-nocturnes and passify them into dullness. All except pillow, who Pipseed is very strongly bonded too. Instead, the mind control from the mimic was able to control Pillow as well, creating a frightening duo. 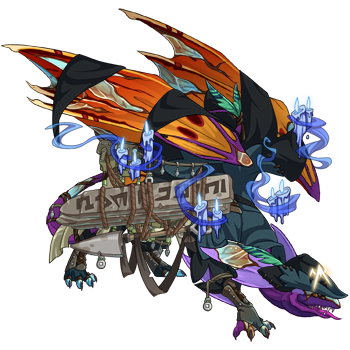 Pillow, [url=http://flightrising.com/main.php?dragon=1054431] [img]http://flightrising.com/rendern/350/10545/1054431_350.png[/img] [/url] Before Pillow lost all control (again), she was able to command her closest friend and warrior to flee the lair and gain recruitment. 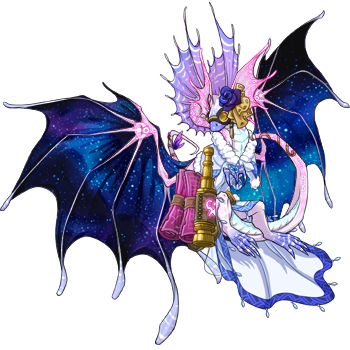 Applewax, a coliseum champion, was able to flee the lair [url=http://flightrising.com/main.php?dragon=935635] [img]http://flightrising.com/rendern/350/9357/935635_350.png[/img] [/url] Once outside she ran into Nulliparas. Not much of a fighter, this small girl is determined to help. The filtering gasmask she wears at all time to help her breath saved her from the fate of her clan-mates . [url=http://flightrising.com/main.php?dragon=21833249] [img]http://flightrising.com/rendern/350/218333/21833249_350.png[/img] [/url] Although much of Applewax's contacts were in the lair and thus compromised, she has connections among the fighters and mercenaries that frequent the clan. Swell is one such bounty hunter, and agreed to help Applewax on her quest for a hefty payment. 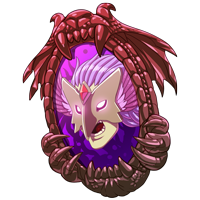 Swell's expertise is subterfuge, and perhaps with his help they can sneak into the lair unseen [url=http://flightrising.com/main.php?dragon=3083533] [img]http://flightrising.com/rendern/350/30836/3083533_350.png[/img] [/url] Considering my lair only as 6 Nocturnes out of like 100, shouldn't be impossible. In fact, Klavdia the fire cop, Bill cipher the dream demon and Holston the plant lich are gonna be the 3 biggest threats. Papyrus the bone mage might also pose some threat. Kladvia has access to the arsenol, while Bill can summon Waay more of his kind and Holston will be able to create reinforcements from the hardy and resilient plant matter surrounding the clan. Applewax could hold them off for a time while Null and swell try and get reinforcements. Either that or somehow rest control bak to Pipseed and Pillow. Once outside she ran into Nulliparas. Not much of a fighter, this small girl is determined to help. The filtering gasmask she wears at all time to help her breath saved her from the fate of her clan-mates . 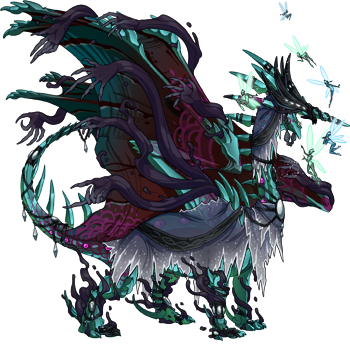 Considering my lair only as 6 Nocturnes out of like 100, shouldn't be impossible. In fact, Klavdia the fire cop, Bill cipher the dream demon and Holston the plant lich are gonna be the 3 biggest threats. Papyrus the bone mage might also pose some threat. Kladvia has access to the arsenol, while Bill can summon Waay more of his kind and Holston will be able to create reinforcements from the hardy and resilient plant matter surrounding the clan. Applewax could hold them off for a time while Null and swell try and get reinforcements. Either that or somehow rest control bak to Pipseed and Pillow. 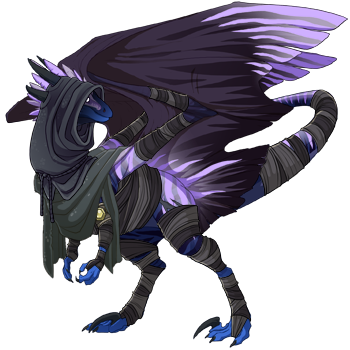 [img]http://www1.flightrising.com/dgen/dressing-room/dragon?did=40993080&skin=1331&apparel=18801,10877,10373,451,491,9449,743,744,716&xt=dressing.png[/img] Stryk [img]http://www1.flightrising.com/dgen/dressing-room/dragon?did=41760739&skin=0&apparel=944,13079,308,314,924,320,337,352,326,2333&xt=dressing.png[/img] Shadowstrike [img]http://www1.flightrising.com/dgen/dressing-room/dragon?did=41956166&skin=11449&apparel=3685,928,28361,4784&xt=dressing.png[/img] Brightclaw I don't actually have any Nocturnes in my clan, so my work around is that Stryk played host to a few while they were passing through. Stryk looked at Shadowstrike and hissed "What do you know about mimics, shadow spawn?" Shadowstrike figited uncomfortably and glanced at the Nocturne that he'd knocked out. " Not any more than what Shadowsong told us, sorry" He replied nervously. Brightclaw looked over to her mate, Shadowstrike and asked "Is the mimic going to kill us all?" Shadowstrike looked at her and replied " No, so long as we do we Shadowsong good us and work quickly, I'd never let it hurt you Brightclaw. " Stryk looked at Shadowstrike and snorted "Then what's the hold up?" Her tail twitched dangerously. Shadowstrike replied "Not knowing where the mimic is." Brightclaw cocked her head and began "I-i think I saw the mimic. The Nocturne was acting like crazy over here," Flicks her tail at the knocked out Nocturne, "I just thought it was some sort of Nocturne eccentricity. I-i'm so sorry, I should have said something sooner. " Brightclaw begins to cry. Stryk walks over to her and says "Don't blame yourself, I kinda knew about mimics from rumors last year,but never thought our budding clan would fall victim to them, just for hosting a few Nocturnes." Brightclaw smiled a bit as Shadowstrike asked her what the Nocturne she saw looked like. " A female, black markings on her, like cracks of darkness." Brightclaw replied. "That's a good start, only one of our visitors looks like that." Stryk said as the three of them set out to track down the mimic. About 30 minutes later.... "IT'S HERE! IT'S HERE! THE MIRROR! THE MIRROR! DON'T LOOK AT IT,IT'LL GET YOU!" Shadowstrike shrieked that spine chilling shriek of a Wildclaw. Just then a Nocturne dropped down from the roof of the cave, she had dark purpleish scales and black markings marred them. The Nocturne had a maniacal grin on her face and was laughing creepily. "Shadowstrike! You take the mimic, me and Brightclaw got the Nocturne!" Stryk called out. Stryk pounced at the Nocturne, as Shadowstrike continued to shriek up a storm. Brightclaw put herself between Shadowstrike and the Nocturne. The Nocturne suddenly lunged at Brightclaw, laughing like crazy and pinned her down! "GET OFF!" She screamed as the possessed Nocturne tried to strangle her. Stryk pounced on the Nocturne and shrieked "LEAVE HER ALONE!" As she tackled the Nocturne. The sound of glass shattering filled the space. The Nocturne whent limp beneath Stryk as Shadowstrike stopped shrieking. "What happened?" The Nocturne asked. Stryk answered "You where bonded to a mimic, it took control of you and made ya' attack us." " By the eleven I'm so sorry, I'm Nightcreeper, I'll be on my way by tomorrow. " The Nocturne replied. The next day.... Stryk is gathering up the pieces of the mimic-mirror and putting them in a box. "What are you doing?" Shadowstrike asks her as he walks in. Stryk looks up at him in surprise and says "Making sure the mimic doesn't come back to haunt us by, sending it to my old pack." "Why? I thought Mirror dragons loved their packs?" Shadowstrike asked , puzzled. Stryk answered "My old pack is an Emperor worshiping cult, I saw that and when I tried to run, they gave me these scars. Better them than us am I right?" " I guess so. " Shadowstrike replied. I don't actually have any Nocturnes in my clan, so my work around is that Stryk played host to a few while they were passing through. "What do you know about mimics, shadow spawn?" Shadowstrike figited uncomfortably and glanced at the Nocturne that he'd knocked out. "Don't blame yourself, I kinda knew about mimics from rumors last year,but never thought our budding clan would fall victim to them, just for hosting a few Nocturnes." Brightclaw smiled a bit as Shadowstrike asked her what the Nocturne she saw looked like.
" A female, black markings on her, like cracks of darkness." Brightclaw replied. "That's a good start, only one of our visitors looks like that." Stryk said as the three of them set out to track down the mimic. "IT'S HERE! IT'S HERE! THE MIRROR! THE MIRROR! DON'T LOOK AT IT,IT'LL GET YOU!" Shadowstrike shrieked that spine chilling shriek of a Wildclaw. Just then a Nocturne dropped down from the roof of the cave, she had dark purpleish scales and black markings marred them. The Nocturne had a maniacal grin on her face and was laughing creepily. "Shadowstrike! You take the mimic, me and Brightclaw got the Nocturne!" Stryk called out. Stryk pounced at the Nocturne, as Shadowstrike continued to shriek up a storm. Brightclaw put herself between Shadowstrike and the Nocturne. The Nocturne suddenly lunged at Brightclaw, laughing like crazy and pinned her down! "LEAVE HER ALONE!" As she tackled the Nocturne. The sound of glass shattering filled the space. The Nocturne whent limp beneath Stryk as Shadowstrike stopped shrieking. "You where bonded to a mimic, it took control of you and made ya' attack us." " By the eleven I'm so sorry, I'm Nightcreeper, I'll be on my way by tomorrow. " The Nocturne replied. Stryk is gathering up the pieces of the mimic-mirror and putting them in a box. "Making sure the mimic doesn't come back to haunt us by, sending it to my old pack." "Why? I thought Mirror dragons loved their packs?" Shadowstrike asked , puzzled. "My old pack is an Emperor worshiping cult, I saw that and when I tried to run, they gave me these scars. Better them than us am I right?" " I guess so. " Shadowstrike replied.